The macula is the small, central part of the retina that allows you to read and see fine details. Damage to the macula can significantly affect central vision. 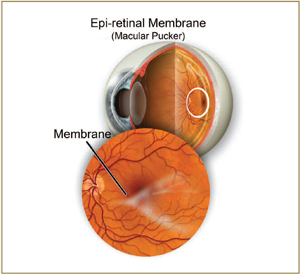 A macular pucker occurs when a clear membrane, like cellophane, covers the surface of the macula. 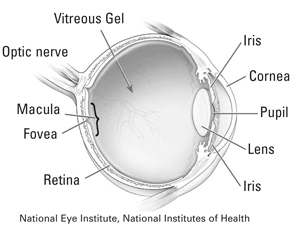 The membrane is made up of a thin layer of cells that settle and grow on the surface of the retina. This condition can occur at any age, but more often occurs in patients over the age of 40. Often these membranes remain completely flat and cause no vision problems. However, in some cases, the membrane will start to contract on the surface of the macula which leads to wrinkling or puckering of the retina beneath. Macular puckers are associated with several eye conditions such as a torn or detached retina, inflammation inside the eye, blood vessel damage in the retina and previous eye surgery. For mild symptoms, a macular pucker can be observed and generally does not cause any damage to the underlying retina. Changing your eyeglasses prescription can help improve vision. If a patient is experiencing more severe symptoms, the membrane can be removed surgically. Surgical removal involves a vitrectomy which requires removal of the vitreous gel that fills the back of the eye through three small incisions in the white of the eye. After removal of the gel, the membrane is gently peeled from the surface of the macula using fine, microscopic instruments. The eye is then filled with a saline solution, and the incisions are closed. Once the membrane has been removed, the retina can flatten back to its normal shape. Vision gradually improves over a period of weeks after the surgery.